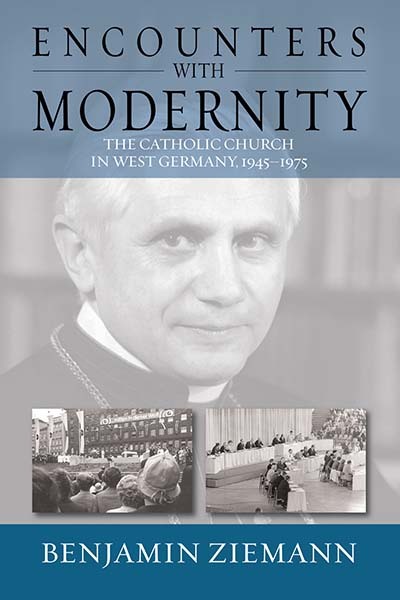 In Benjamin Ziemann’s historical account Encounters with Modernity: The Catholic Church in West Germany 1945-1975, to be published next month, the author explains how the church attempted to systematically — using the tools of social science — maintain its relevance in post-war German society. Following, the author explains how he, almost completely by accident, happened upon this research that would lead to his future book. Rather than being the result of meticulous planning, I stumbled over this topic by chance. Originally, I had an interest in writing about the Catholic milieu in 1950s West Germany, and thought that starting with the miners at the Ruhr would be a good idea, not least because I taught at Bochum at the time. One of the challenges that I faced was to gather data on the practiced piety of Catholic workers such as church attendance or Easter Communions, which I thought were difficult to obtain. While I spent time pursuing other hints in the Essen municipal library, I found reports by the “Pastoral Sociological Institute of the Diocese in Essen” (PSI) for the late 1950s. This institute had broken down a count of churchgoers in Essen according to social strata, gender and other social characteristics. Here, I had all the data that I seemed to need. But why on earth would a Catholic bishop – the diocese of Essen was only founded in 1957 – want to rely on the services of his own sociological research institute? This question stuck in my head. I remembered that the Catholic Church in Germany had started to conduct an annual statistical count of churchgoers in 1915, although these were only aggregate data compiled for each deanery. I also recalled that one of the biggest opinion polls that surveyed religious attitudes had been commissioned by the West German Bishops in 1970, producing data that had been widely used by contemporary historians and sociologists ever since. And I started to read about the French tradition of “sociologie religieuse,” about clerics and lay-sociologists who embarked in the 1930s on a long-term study of the social geography of religious practice in France since the revolution in 1789. At this point, a new line of inquiry shaped up. Instead of trying to gather accurate data about Catholic piety, I became interested in the “empirical gaze” that drove the various attempts by the church to compile such data in the first place. I engaged with recent historiography on the “scientization of the social,” studies that were informed by historian Ted Porter’s pioneering work on the social uses of statistics. As I changed tack and started to scrutinize sources on the foundation and the practical work of institutes such as PSI in Essen, I understood that highly ambivalent feelings were driving these initiatives. In the postwar Catholic church, ambitious hopes for a re-Christianization of society stood next to deep-felt anxieties about an increasing secularization. And as church sociography – as practiced by the PSI – did not any longer produce meaningful results, church officials moved on and tried to survey attitudes and mentalities, using the more complex tools of opinion polls and motif analysis. And in the early 1970s, in the wake of the Second Vatican Council and of the revolt of 1968, even the institutional and pastoral structures of the church itself were scrutinized and optimized with the help of organizational sociology. As I went along and studied the different uses of applied social research in the Catholic church, from statistics to organizations research, I realized that these were encounters with modernity, that the church used these methods as tools to understand an increasingly complex societal environment. Looking back at the protracted gestation of my project, two things about this topic really stand out for me. First, I learned that historians of post-1945 Europe (and the USA!) have to develop new ways of looking at data from empirical social research. We need a new form of primary source criticism with regard to the texts, diagrams and tables sociologists have produced, ways of seeing social science data not as artifacts but as forms of mediating and constructing social reality. Among others, Sarah Igo – in her fascinating book “The Averaged American” – and Martin Lengwiler have made important contributions to this debate. Second, I am convinced that my study of the “scientization” of the Catholic Church offers fresh conceptual perspectives for church history, or the history of organized religion. From the vantage point of those sociologists and priests who championed and practiced a sociological study of the church, we can probe into the ways in which a complex organization like the Catholic Church tried to engage both with accelerated social change and with the prospects and agendas for church reform that the Vatican Council had opened up. Against that backdrop, it is probably less important to know the exact percentage of miners in Essen who attended Sunday Mass in 1959. Benjamin Ziemann is Professor of Modern German History at the University of Sheffield. He is the author and editor of numerous books, including Contested Commemorations. Republican War Veterans and Weimar Political Culture (Cambridge, 2013), War Experiences in Rural Germany, 1914-1923 (Oxford, 2007), and, as co-editor, Reading Primary Sources (London, 2008). He has held Visiting Fellowships at the University of York, Humboldt University Berlin and at the Norwegian Nobel Institute in Oslo.